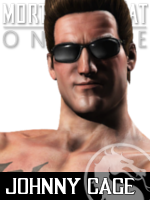 Mortal Kombat's Johnny Cage is coming to challenge the superstars of WWE Immortals [full story]! To make it in the ring of World Wrestling Entertainment it'll take more than genetic gifts - it's all about grabbing the proverbial brass ring! What better way to do that than by taking advantage of the limited Early Access? WWE Immortals is the third free-to-play app from NetherRealm Studios - the makers of Mortal Kombat X! Available to download for iOS and Android; it's another card collecting beat 'em up, this time featuring the legends and superstars of World Wrestling Entertainment as reimagined by NetherRealm Studios! It's the second time a character has crossed over from the home team. Scorpion reprised his role as an inter-dimensional invader in the mobile version of Injustice: Gods Among Us [full story]. We're sure he would've loved to get the push in WWE Immortals, too, but as Bray Wyatt says - anyone but you! There's gonna be a Cage match - but which WWE Superstar will you challenge first? Register to cut a debut promo on the forum! Join Mortal Kombat Online's ministry of darkness by liking & sharing stories via @MK_Online, Facebook & YouTube! Not having Scorpion as the guest character is great--having it be Cage is even better!